Chartered Physiotherapists use acupuncture for pain relief using traditional Chinese acupuncture points and trigger points. A thorough examination of your problem is necessary before using acupuncture to identify the cause of the pain. This allows your physiotherapist to make a full diagnosis of your condition and select the appropriate treatment. Acupuncture for Migraines and Headaches: A research review published in 2009 suggests that acupuncture is at least as effective as, or possibly more effective than, medication in protecting against migraines, while another review from the same year shows that acupuncture may be beneficial for people with frequent episodic or chronic tension headaches. 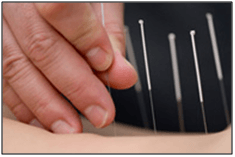 Acupuncture for Arthritis: Research indicates that acupuncture may be useful for people with osteoarthritis. (especially osteoarthritis of the knee). In a 2007 review and meta-analysis, for instance, researchers concluded that acupuncture administered in an intensive two to four week treatment regime may offer significant short term relief of osteoarthritis related knee pain. Acupuncture for Low Back Pain: In a 2009 a study of 638 adults with chronic low back pain participants undergoing 10 acupuncture sessions (administered over the course of seven weeks) had greater improvement in symptoms than those who received standard care. One year after treatment, study members in the acupuncture group were also more likely to show significant improvements in their condition. Acupuncture for carpal tunnel syndrome. Acupuncture for rotator cuff tendonopathy. Acupuncture for thigh and hamstring pain. Acupuncture for calf and shin pain. Acupuncture for plantar fasciitis and heel spurs.